I must confess to knowing very little about geomancy and dowsing and at the same time let you know I am also very curious, an inveterate asker of questions. John Irwin asked if I might say something about my work with yew trees and invite BSD members to take up some of my questions. These are questions geomancers might find interesting and in the process we may get to know more about our ancestors’ relationship to ancient yews. I would like to give you some background first before posing my three questions. I have been involved over the past few years in a personal project celebrating ancient yew trees through photography and writing. I am interested in the visual impact of venerable yews and the meaning these trees have for us today. My latest exhibition is at Hull Museum and Art Gallery from 20 January to 25 March. Britain has more ancient yews than anywhere else in the world with a lost cultural tradition preserved in pre-Christian myths and living trees; archaeology seems to have missed the significance of living yews in its search for artefacts and buildings. The methodology of ageing yews has become more precise and solid in recent years confirming many of the estimates of age proposed by the pioneer visionary Allan Meredith. Over 500 yews are at least a thousand years old, some are many millennia and the oldest may go back to the time of first construction of Stonehenge and Silbury Hill. Virtually all our venerable yews are in churchyards; a substantial number are probably Saxon but many predate Christianity. I am wondering if geomancy can tell us more about why specific ancient yews are where they are and what their relationship is to other significant features and the wider landscape. 1 Why is a specific yew tree planted where it is in the landscape? I have noticed that the position of old yew trees does not seem to be random in relation to the topography of the land. If the church or other human constructions near the tree are mentally removed the tree can be seen in its wider place. Many yews seem to look out over a landscape such as a river valley: the tree may mark the place to stand and take in the surrounding land. Other trees are a focus for the eye, being sighted in the centre of an open space, asking to be looked at. The location is so often notable. For example there are a series of ancient yews, and we have lost others, looking down on the course of the river Thames. I carried out a comparison and noticed that in contrast to early churches those founded in Victorian times invariably had no sense of place; they could be anywhere along a road and where the topography was not necessarily impressive. It is known that most early churches were founded on previously pagan sites, hence the large number built on or next to springs. The sense of place comes through from the choice of sacred sites by pagan cultures. Can geomancy shed any understanding on the location of specific yews? 2 How much of an association is there between yew trees and wells, and why? 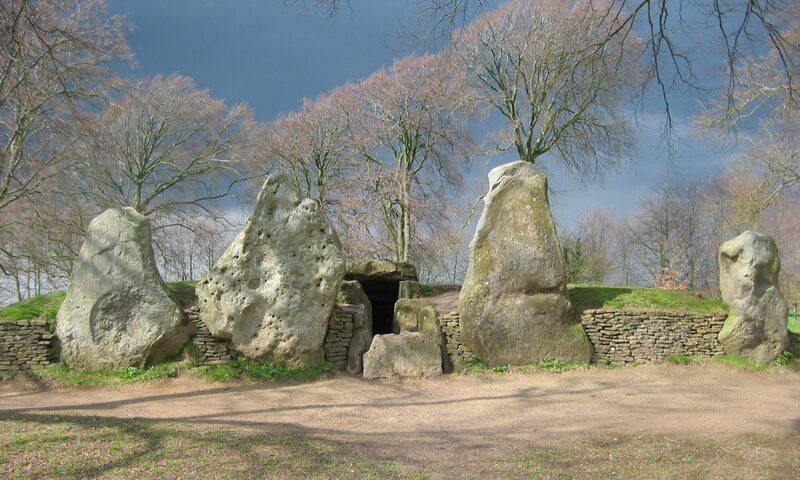 The pagan Celts had a strong sense of place; sacred groves, individual trees, stones, mounds, springs and fires all acted as focal points for their spiritual practice. Evidence from across northern Europe points to the yew as an inspiration for the Tree of Life. In the story from Scandinavia Yggdrassil, the World Tree, is nourished by sacred wells. There are about half a dozen known sites where an ancient yew stands near a well. (i.e. Ffynon Bedr, Hope Bagot, Gwenlais, Askerswell, Tangmere) There are probably more because churches were often built over a well. Can geomancy identify hidden or lost wells near old yews, or explain the connection between the two? 3 What is the explanation for the uneven distribution of ancient yews in Britain? Ancient yews are absent from Eastern England and Cornwall, and are very rare in Scotland, . The most concentrated areas are Wales and the English counties bordering it, as well as Hampshire, Sussex, Surrey and Kent. The most commonly given explanation is that the Danes intimidated the Britons by chopping down the eastern sacred yews; possibly true but we have no further evidence for this. The distribution of ancient yews is not strongly linked to the natural distribution of yews, climate areas, Christian dioceses, megalithic sites, Roman occupation, or Saxon settlement (excepting the concentration of 1,500 year old trees in the South East). This leaves us without a satisfactory explanation as to why the ancient yews were planted where they were, and still are. I wonder if I have aroused anyone’s curiosity? The Sacred Yew by Chetan & Brueton (Arkana) has a gazetteer of ancient yews. I can supply grid references to specific sites in any given county for anyone interested in researching ancient yews.